SENIOR EXPO 2018 - April 18, 2018 - 13 AAA BENTONVILLE VISIT: 1501 SE Walton Blvd. 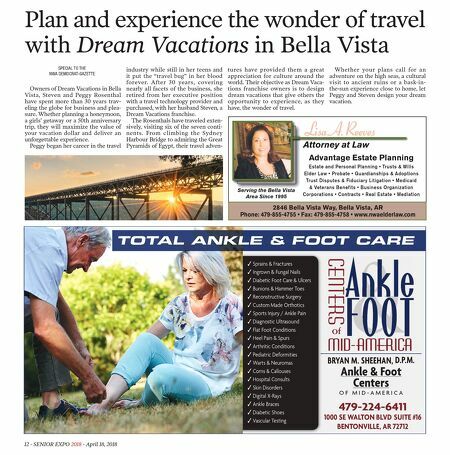 CALL: 479.254.9223 AAA FAYETTEVILLE VISIT: 3595 N. Shiloh Drive CALL: 479.444.9222 HOURS 9-5:30 Monday-Friday 9-1 on Saturday plan your ESCAPE Don't let another spring and summer pass by without a vacation. Try European river cruising, Canadian rail adventures, the islands of the Caribbean, or an Alaska land-and-sea journey. 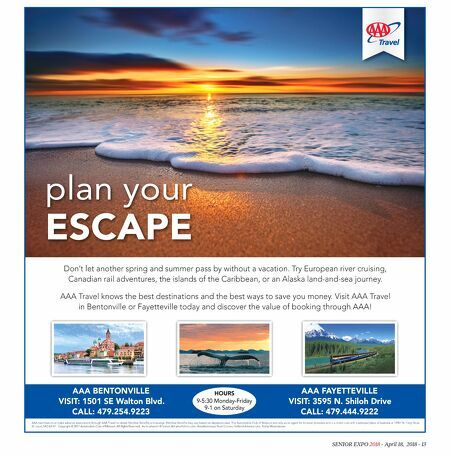 AAA Travel knows the best destinations and the best ways to save you money. Visit AAA Travel in Bentonville or Fayetteville today and discover the value of booking through AAA! AAA members must make advance reservations through AAA Travel to obtain Member Benefits and savings. Member Benefits may vary based on departure date. The Automobile Club of Missouri acts only as an agent for its travel providers and is a motor club with a principal place of business at 12901 N. Forty Drive, St. Louis, MO 63141. Copyright © 2017 Automobile Club of Missouri. All Rights Reserved. As to artwork: © tomas del amo/fotolia.com, AmaWaterways River Cruises, Holland America Line, Rocky Mountaineer.